'Storm in a Teacup', Helen’s first book, has just been announced as the joint winner of the Asimov Prize. 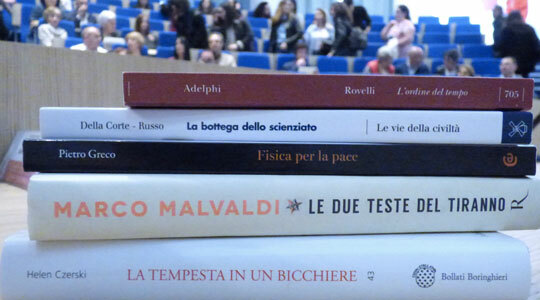 The Asimov Prize (Premio Asimov) is awarded annually to a popular science book edited in Italian. It was established in 2015 by the Gran Sasso Science Institute, and the winner is selected by a large jury of high school students. The winners were announced on the 21st of April 2018, and the prize will be awarded in a ceremony in L’Aquila in October 2018. “I’m hugely honoured and excited that "La tempesta in un bocchiere” has been chosen for this award. It’s particularly special that it was chosen by high school students who are at the start of their journey with science, and who are building a foundation for their perspective on the world. It is their contributions that will build the future, as citizens and voters and maybe also as scientists and engineers. I wrote this book because it's so important to highlight the connections between the everyday world and the big questions that we face as a society. We should all have access to explanations of how our world works, and the chance to feel that we can think about and investigate ideas for ourselves. I hope that this book gives more people the confidence to take that path."